This week I came home to a nice incentive to continue spending on my US Airways® Premier World MasterCard®. For spending $750 per month on my card in October, November, and December I will earn 15,000 bonus US Airways Miles! The new targeted promo available is a great way to earn 15,000 US Airways bonus miles and is similar to other targeted offers US Airways cardholders that have been around. Barclaycard appears to be working hard at getting cardholders using this card before the end of the year since it will no longer be available to new customers after the US Airways and AA merger completes. The new promotion available is for 15,000 bonus mile after hitting the additional spend for all three months. That’s a considerable bonus for an easy additional spending requirement and means that I in total I will earn 17,250 miles for spending $2,250. This breaks down to earning 7.7 miles per dollar, which is hard to beat! I received the offer through snail mail, however most of the reports of people receiving the targeted offer are via email. If you have recently applied for the US Airways® Premier World MasterCard® be sure to check both your email inbox and mailbox for a similar offer. Applying for the US Airways® Premier World MasterCard® right now to earn the 40,000 bonus miles is a no brainer in my opinion. Now is an ideal to earn the miles given that this card will only be around for a short time, plus the 40,000 mile sign-up offer does not have a spending requirement. Barclays is one of the best card issuers when it comes to incentivizing its card holders to continue spending on their cards. In fact, I received a similar offer the last time I applied for the US Airways® Premier World MasterCard®. It seems that almost everyone who applies for this card receives a targeted offer like this at one time or another. That said, one theory is that if you have a long period of no spend after receiving the card it may trigger a targeted offer. With these enticing additional spend bonuses Barclaycard appears to be trying to draw in new US Airways Premier World MasterCard users before the merger goes through in hopes that they will continue to use their new AA card that it will be converted after the merger. Of all the various offers out there I consider this one to be one of better offers, but it may even be possible to be targeted for the same 15,000 bonus miles but with a lower spend of $500. Is the US Airways 15,000 Bonus Mile Promo Worth it? Earning 7.7 US Airways miles on everyday purchases is definitely worth it! I will certainly take advantage of this offer because it is a great way to earn additional bonus miles on the US Airways® Premier World MasterCard®. Hitting the $750 spend per month can be quite easy with everyday living expenses for most people. Of course another option would be to purchase one $500 gift card and spending an additional $250 per month, which would make it pretty effortless. I highly value US Airways miles because they offer incredible flexibility and allow generous stopover routings on award flights. Currently they also have one of the more competitive award charts out there—be sure to take a look at how to maximize US Airways miles. Adding the 17,250 bonus miles to my account for additional spend is a great way to earn extra US Airways miles before the merger completes, or wait for them to convert to American Airlines miles after 2015. Most people tend to receive targeted Barclaycard offers after a period of no spend on their cards. From my experience this seems like the most likely way to get targeted for an offer since I have not used my card after its first use several months ago. 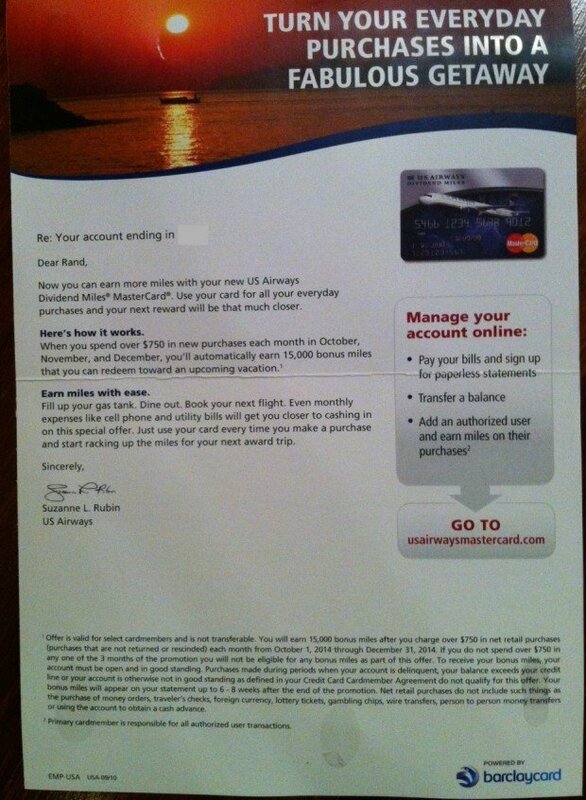 I also received a similar offer on my first US Airways Mastercard last year. Barclaycard also sends out similar targeted offers for the Barclaycard Arrival Plus™ World Elite MasterCard® and the Premier Miles & More® World MasterCard®, however, I’ve never received any targeted offers on my Arrival card. Given that Barclaycard sent me this offer just 6 months after I opened my US Airways® Premier World MasterCard® it’s certainly possible to be targeted at any point. There’s no sure fire way to get the offer, but it’s certainly worth taking advantage of if you do and a period of non-spend on the card may be part of the equation to be targeted. Barclaycard has been sending out targeted offers for 15,000 bonus US Airways miles after spending $750 (sometimes as low as $500) every month for three months. I consider this a valuable and easy way to earn some extra US Airways miles, and I’d certainly take advantage of it. If you have the US Airways Mastercard or recently applied be sure to check your snail mail and inbox to see if you’ve received a targeted offer. As the card will no longer be available after the US Airways and AA merger completes the US Airways® Premier World MasterCard® is a great way to earn 40,000 bonus miles after the first purchase. Ultimately there’s no way to be certain but you may even have time to received the targeted offer and earn another 15,000 bonus miles.